It would seem that Sophie, whom I introduced to readers of this column more than seven years ago as the cutest puppy in the whole wide world, isn’t so cute after all. At least that’s the verdict in the Herald-Citizen’s 2018 Pet Calendar Contest. She came in 21st out of 25 contestants. I wrestled with my conscience before entering Sophie in the contest because I thought it unfair to the other pets. Clearly, her outstanding looks put her head and shoulders above the rest. She was bound to be a shoo-in for first place. I checked with H-C Publisher Jack McNeely to be sure I wasn’t violating the rules by entering. He assured me that, since I’m a freelancer and not a member of the news staff, I was welcome to participate as long as I didn’t write a column urging readers to vote for Sophie. So I didn’t. But I did mention to any of my friends who were willing to listen that Sophie was Contestant #10. If they felt inclined to donate to spay and neuter programs in Putnam County, voting for her was as good a way to do that as any. For a mere five dollar contribution, they could cast ten votes for Sophie. As it turns out, she garnered a grand total of 60 votes of the almost 18,000 cast. Only Ivy, Dynamite, Freya and Oscar received fewer. Bless their hearts. It didn’t take much digging to find out that the Calendar Contest isn’t really about which pet is cutest. The primary purpose of the contest is to raise awareness and money to help slow the epidemic of pet overpopulation by making funds available to those who can’t afford to sterilize their animals. Sophie herself is the result of an unplanned pregnancy. Her mother was a pedigreed boxer whose owner planned to breed her. But, as happens all too frequently, the boxer escaped her confines while in heat and gave birth to a dozen mixed-breed puppies. All of which were adorable, but I got the pick of the litter. And I had Sophie spayed just as soon as it was medically safe. 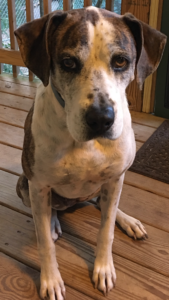 Congratulations to Lacy, the rescued pointer mix whose harrowing story was featured in the December 5 issue of this paper. She’ll grace the cover of the 2018 calendar. Nibbles, Ellie, Batman Returns, Suzie, Snuggles, Jeffery, Holly, Palmer, Tommy, Tootsie Pop, Sweetie Pie and Baxter will be featured as Pets of the Month. But don’t get out your crying towel yet. The 12 pets who didn’t make the cut, including Sophie, will be pictured on the back of the calendar, which went on sale a couple of days ago. Get yours before they’re gone. The calendars are selling for the hard-to-say-no-to price of only $3 each, or five for $10. What a great way to welcome 2018 and contribute to a great cause all at the same time.